Shoot me now. More later. I've been super busy this week. I volunteered to help coordinate the piping competition at the Loch Lomond Games this year. Last year, it didn't get sanctioned until the last minute and was never added to the WUSPBA web site's events page. This year it was sanctioned early and entry forms were available for download from WUSPBA. The downside to all this was it takes time. I was coordinating with WUSPBA, filling out judging sheets, working out a competition schedule, e-mailing pipers, confirming the judge, etc. There were a few tricks with the schedule. One, it couldn't be done until I had all the entry forms in hand. 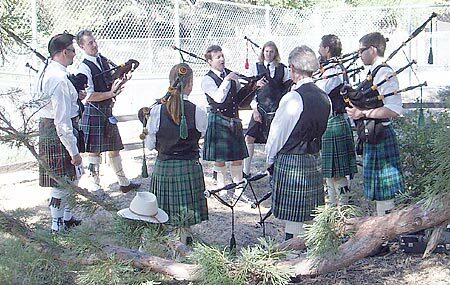 Second, as a number of the members of Santa Cruz Pipes & Drums (myself included) were doing solo competition and they couldn't be playing at the main stage and competing at the same time. Third, the games could only afford one judge, so concurrent events were out of the question. Anyway, the days leading up to the games were busy. One night it was after midnight before I finished. To top it off, I'm at the tail end of a bad cold (sneezing, throat clearing, etc.). I was up around 6:30. I got a return call from the judge at about 7:15, Bruce Woodley, confirming that he was indeed coming and I was out the door 10 minutes later. I was planning out things in my head when I realized that I'd missed my exit and was about to head to San Jose! (I gotta stop doing that!) I took the next right exit and doubled-back. I arrived at the remote parking location, and took the shuttle bus up to the games site with Wes Weber (Los Gatos Police PB) who decided to sign up as a field entry. I dropped off the kilt numbers I made up as well as the list of competitors at the gate booth about 8:15, explained the procedure to Bonnie (one of the ticket people), taped up a "Pipers Sign-In Here" sign then headed over to set up the judge's area. The whole day was practically a whirlwind. I got to see a lot of "regulars" which is always a pleasure—plus some new faces. Unfortunately, Tom Jenkins e-mailed me the night before the games and said he had something come up with work and had to scratch the whole day. I was scheduled for competing at 10:50 in the 2/4 March. I was second to last to play. I gave Bruce Woodley my tune, 'Siege of Delhi.' I felt I had the drones fairly close, I could tell they weren't dead on. I'm still having trouble hearing the bass drone (tenor going) while tuning against a high hand note—against a wall, it's easier, but out in the open is tougher for me. I'm almost always practicing indoors, so not many opportunities to improve that. Chokes. Drones flat from start. Rushing phrases -> to grips. Also starts of parts... in fact tempo is all over the map. Try a metronome. Is the tune selection appropriate? I had a single choke in the tune, in the second part—haven't had one of those for a while. Chokes are a killer. I was pretty disappointed at that, but tried to just focus on the tune. I got into the third part and realized that the tempo suddenly was off, too slow. (Sigh, should be marching!) I got to the end of the line and messed up as I my attention was on the tempo issue not the music. I wove back in as best I could and finished off the tune. Gag. I acknowledged the judge, got a "thank you," then turned to the 30 or so listeners and made a grimace face. No miracle medal with that kind of tune. There wasn't much time to dwell, it was time to find the band for tuning up to lead the 'Parade of the Clans.' The band pitch was significantly different than in the past—it was a pretty warm day—and my chanter didn't take to this pitch that well. My High-A was flat (even with no tape and already a touch carved) and the high hand in general was either hard or impossible to correct. Tuning up prior to our first performance. My chanter's getting the quick once over by PM Jay Salter. Left to right: Mike Lindelsee (who'll probably be joining the band next year), Michael Haughey, Nancy Fredrick, me, Daniel McGillivray, Ken Miller (gray hair), Jay, and George Holbert. Unseen is Paul Lewellyn (behind Jay I believe), Daniel Holsapple and the drummers. Thanks to Mike Lindelsee's friend Dimitri for the photos on this page, I was too busy to take any! Once the parade was done, it was back for a set or two away from the main stage, then a race over to the solos for Paul Llewellyn's Slow March at 12:40. (Paul had flown in late from an overseas trip and had missed the 2/4 competition.) Paul would be followed by more Jay Salter students: Daniel Holsapple (in our band), Mike Lindelsee, George MacKay, then me. Finally would be young winning piper Amanda Gifford, hot off of taking a number of first places at the Dixon Games. Ken Miller (bandmate) and Jay said I was looking pale. I realized I hadn't eaten anything but a small bowl of cereal very early that morning. I wolfed down a roll of meat and cheese with a bottle of water, both from the hospitality room (for volunteers) less than 10 minutes before my performance. Ken was kind enough to hold my pipes as I tried not to give myself indigestion! Jay was busy tuning up each of his students in turn. As my time came up at 1:00, he got my drones tuned to Low-A and off I went. I started the tune, which sounded fine—until I got to the high hand. Some of those high notes just made your skin crawl a bit. (At least to me. Amanda Gifford's dad, Gary, said it sounded pretty good—of course, he was on the other side of the house behind which we were competing!) I rushed off of some notes just cause I couldn't stand it. It was hard for me to get the expression I wanted. Nancy Fredrick—who recently moved out of state, but came back for a few weeks and made this performance day with the band—said it sounded pretty good, but that I could have held some of the notes for better expression. I totally agreed. I don't remember any chirps or crossing noises, but perhaps I was distracted. In any case, it was back off to quickly tune up the band again for the 1:45 performance. The bass drone is tuned at the bottom joint. The top joint is set at the optimal acoustic point—around the hemp line—and left. George is resetting the top joint before tuning at the bottom. I had time to retape my chanter and I changed E and G. High-A was still just absolutely incurable. F sounded a little weird too. I checked with Mark Holsapple, to see where we were with schedule. I was next. I tuned up the drones and got them pretty darn close. I told Bruce Woodley my tune and took a few steps away. I turned to see if he'd managed to find the tune in his book yet: "Hmmm. No book. Must know his tunes." I checked the drones, sounded pretty good against Low-A. The problem was once I was into the tune, the drones sounded way out against the high hand. I had one very tiny, tiny chirp of a crossing noise in the first variation—barely half of the small blurp I had managed in the slow march at Pleasanton last month where I took 2nd place. Other than that, it was steady blowing, the expression and phrasing was very strong—based on Rob Boyd's comment at Pleasanton, I held the Low-A even longer to pronounce the transition between the ground and the variation. It felt good. The only things were the tuning and that one 'micro' crossing noise. Need to play L1 of the ground again. I got asked by one of Kip Moralis' group, Shep, how I did. (Deja vu!) "I don't know, but if I don't finish in the top five, something's wrong!" Well, I didn't finish in top five. I finished seventh out of ten. I'm still scratching my head a bit. The judge must have put a lot of weight on the tuning. Again, tuning is killing me in competition. Next year, I'll have to have a solo chanter standing by to swap with the band chanter, just in case. Not sure about the needing to play line one of the ground again. I've never seen that comment before in a Grade IV competition. Higher grades, yes. That's standard practice when you are playing a whole piobaireachd. But in Grade IV, you are just playing the ground followed by the next part of the tune, doubling, variation, what have you. It'd be slightly out of place to insert the first line of the ground there in my opinion. 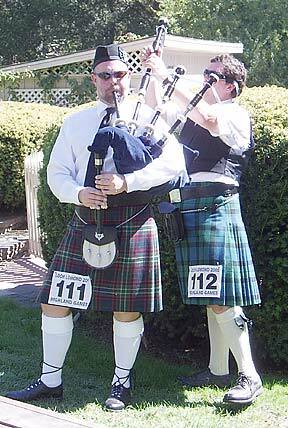 I did see one piper do that in Grade IV at Pleasanton last year, that's the only time I've ever seen it. Aside from that one tiniest of crossing noises, technically it was all there. Expression was all there. Daniel Holsapple, who admittedly messed up a number of things with his doubling of the ground, finished fifth. Ah, well, I'll just dwell not leaving the door quite so open in the future. We took down the tent. I got myself a Loch Lomond Games T-shirt for all my hard work. I collected all the judging summaries and score sheets for their trip to the WUSPBA registrar. Someone handed me my jacket which I would have completely forgotten. I caught the shuttle bus back down to the parking lot, chatting with Paul on the way, and drove home for some well earned rest. Loch Lomond is my last games for the year. Kip Morais and Amanda Gifford are both moving up to Grade III next year. After a fairly successful last season and a strong start this year, what seemed like an almost certain move to Grade III for me is now not so certain. Sure, I could just register and move up, but right now I feel like I'd just get completely killed. Kip was trying to convince me to move up—I think he wants company! But finishing in the middle of the pack in events in Grade IV is not Grade III material. The other question is if I get my tone issues worked out and get a new 2/4 March that's learned perfectly from the ground up—real metronome work this time—if I'd "knock 'em dead" in Grade IV next year. Man. Where's a crystal ball when you need one?